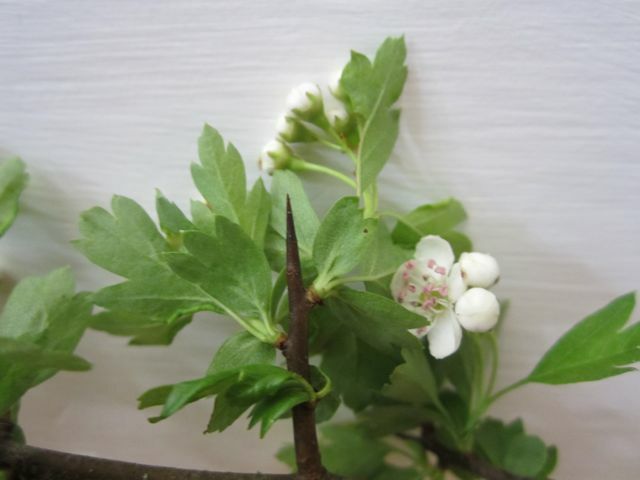 Hawthorn is one of the first plants I gravitate toward when I needed strength, protection and nourishment. I craved it when I was pregnant with my daughter– probably because it helped my heart and blood vessels, which were under enormous pressure. I have seen it ease other types of pressure to the heart including grief and anxiety. The leaves, flowers, and blood-red berries all have medicine and can be prepared in many ways. 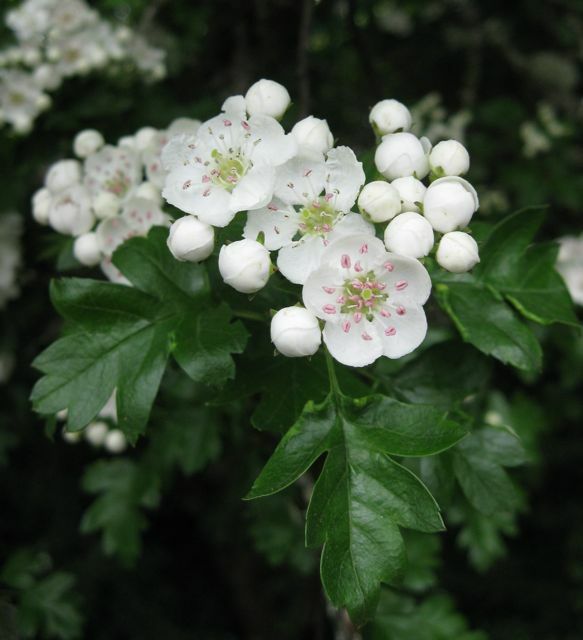 Identifying Hawthorn: Hawthorn is a large shrub or deciduous tree with branches that are armored with large thorns. It is native to America, Northern Africa, Central Asia and all of Europe. The leaves are serrated and medium to dark green colored. Fragrant flowers are small, pinkish-white, and bloom in thick clusters. Berries are red to blue-black in color and have large seeds. Hawthorn is in the rose family. There are over 100 species of native and cultivated hawthorns in North America, which are very variable and can be difficult to distinguish. Our native variety has deep green leaves and blue-black berries. 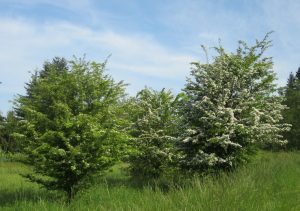 European hawthorn is very common in forested areas and open spaces. It has small deeply lobed leaves and red berries. I do not harvest the hybridized pink varieties that are commonly planted in cityscapes. Hawthorn berries are a favorite food for many birds, and in exchange, the birds distribute the seeds far and wide. They germinate best after passing through a bird’s digestive system since the stomach acid breaks down their seed coat. When and How to Harvest: Hawthorn leaves and flowers are usually ready to harvest in early May. I prune healthy looking small branches when the flowers are just opening. Do not be deterred if you detect a slight fishy odor of the fresh flowers. Your nose is picking up a compound called trimethylamine. This is hawthorn’s ingenious way of attracting flies and other pollinators. The smell disappears when the flowers are dried. Dry branches in baskets, in paper bags or bundle with rubber bands and hang them. Once completely dry, the leaves and flowers will easily come off the branches. Be careful to avoid the thorns! Hawthorn berries are gathered in late summer or fall and can be carefully dried in baskets or a food dehydrator. English herbalist Juliette de Bairacli Levy said that the leaf buds are called “pepper and salt” and are traditionally eaten in salads. The berries have a sweet taste but here is the trick – they have a very large seed. You can carefully eat off the outer flesh and spit out the seed like with cherries. Hawthorn powder is added to flour in Africa. It is high in the trace minerals selenium, which is important for the immune system, and chromium, which enhances the function of insulin. You can also make delicious hawthorn jelly. The berries are very high in a thickening agent called pectin, so you can use half the recommended pectin to get a nice consistency. I have made a delicious jelly with apples, rosehips and hawthorn berries. My hawthorn cordials have gelled when I boiled the berries, but we simply called them hawthorn jello shots! Hip bartenders, take note. See the cordial recipe for creative ideas. Hawthorn increases the heart muscles ability to contract while it gently relaxes blood vessels. The effect is that the heart pumps better and has less resistance to pump against. This is why hawthorn can help raise low blood pressure and reduce high blood pressure. Hawthorn relaxes smooth muscles of the coronary artery walls and allows more blood to flow into the cells of the heart. This means more oxygen and nutrients are delivered to heart cells and waste products are removed. It is therefore supportive for acute conditions like angina or pain due to a lack of oxygen reaching the heart. According to herbalist Rudolph Weiss, hawthorn is used in Germany for treating early stages of congestive heart failure with diminished cardiac function, a sensation of pressure or anxiety in the heart and mild arrhythmias. Antioxidants including proanthocyanidins and flavenoids in hawthorn leaf, flower and berry strengthen blood vessels and even heal damaged vessel walls. They also help arteries to be more pliable. 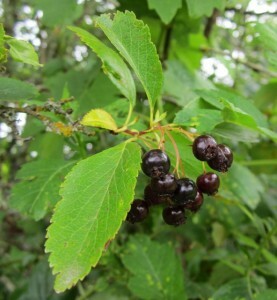 Hence, hawthorns usefulness for atheroscherosis, which contributes to angina and heart attacks. Like other members of the rose family, hawthorn is a gentle astringent. It contains tannins that help to tighten inflamed and irritated tissue. This correlates with it’s traditional uses including diarrhea and upset stomach. Hawthorn fruits and flowers or “shan zha” are also used in Chinese Medicine for hypertension, as an astringent, and as a digestive aid for stagnant conditions. This makes me think about the fact that hawthorn contains soap-like compounds called saponins, which can increase membrane permeability and help break down fats. 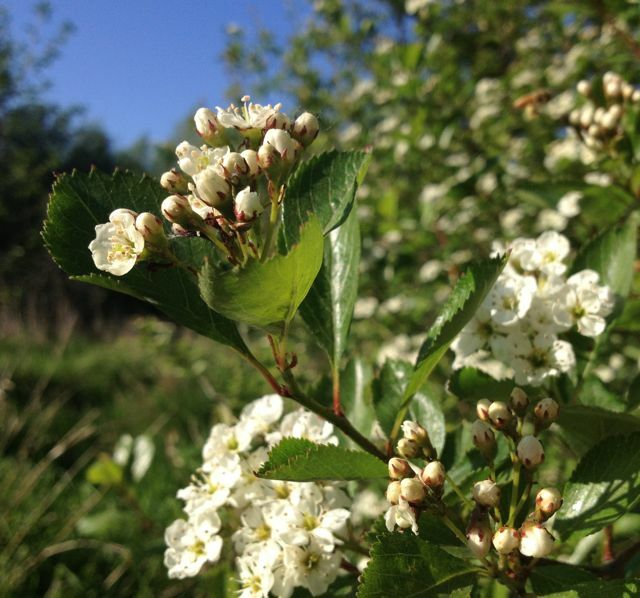 Hawthorn is a long-term remedy and should be taken for several months to several years for maximum benefit. Think of it as a superfood to your cardiovascular system. It can be taken as tea, tincture, cordial or capsules. Homeopaths and flower essence practitioners also use it. Hawthorn Tea – Steep leaves and flowers in boiled water for 15 minutes. The berries are steeped for 15-30 minutes. They can also be boiled for ten minutes but they will lose some of their medicine including vitamin C. Drink up to three cups a day. My 4-year-old’s favorite tea is hawthorn nettle. It also combines will with dried berry leaves including raspberry and huckleberry. Tincture: Place fresh leaf and flower or berry (fresh or dried) in a glass jar and cover with alcohol (brandy or vodka.) Let sit for at least 2 weeks. Strain with muslin cloth. Store the tincture in a glass jar in a cool dark place. Take 30-40 drops three to four times a day. 12 oz. Alcohol (this could be vodka, brandy or better yet, a tincture of hawthorn leaf and flower or berry with a minimum of 40% alcohol. Place hawthorn in 16 ounces of cold water. Bring to a boil and simmer until the water is reduced to 8 ounces. Strain through muslin cloth and place the tea back in a clean pot. Add black cherry concentrate and honey. Heat and stir until honey is dissolved but do not allow to boil. Turn off and allow to cool. Add alcohol, stir ingredients well, then bottle in glass jars and store in the refrigerator. This cordial will last 6 months to a year. 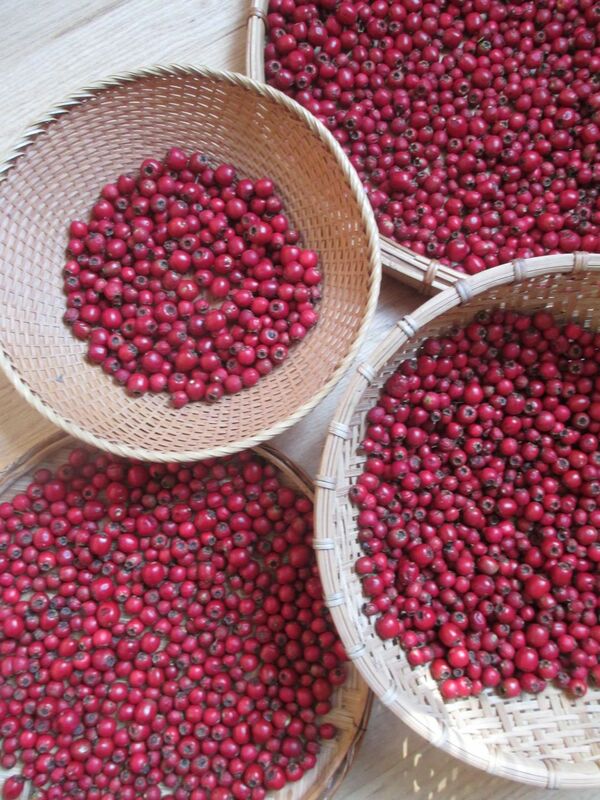 Hawthorn berry is high in a thickening agent called pectin. When making fresh plant tincture, it may become jelly-like. This is less likely to happen if the berry is dried. 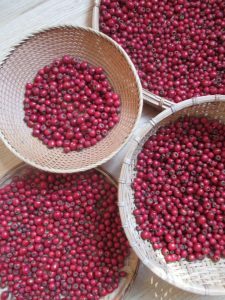 Pectin is an adventitious ingredient when making jelly and a simple recipe of ground hawthorn berry, ground rosehips and apple juice makes a delicious tonic jelly. Caution: If you are using cardio-active pharmaceuticals like digoxin, consult your doctor for supervision. I have seen hawthorn touch people in astounding ways. Call it the spirit of the plant, the energetic quality or the plant constituents – it does not matter. Hawthorn can act like balm to the heart during difficult times. I have seen it bring a sense of calm and stability when people feel grief stricken, alone, disheartened, unguarded and even outraged. I think of it as a protectress – for when our heart is broken, everything else stops. As my teacher and friend Joyce Netishen says, hawthorn heals the bloody wounds of the spirit. I ponder those wicked thorns and also the bioflavenoids and other compounds that act as healers. In the presence of hawthorn, the heart does not have to bear the burden of trauma or poor health alone. Hawthorn was prized among Northwest Coastal Native People for many things. In addition to the flowers and berries being used as medicine, the large black thorns were used to make fish hooks, sewing awls, and lances for probing blisters, boils, and for piercing ears. The wood is unusually hard and has been fashioned into tools and weapons. It also makes long-lasting and hot fuel. Hawthorn stories abound in European folklore. It is called “may flower” and has been an important part of European May Day celebrations, spring ceremonies and weddings since Roman times. The May Day festival is ancient and was named after the Greek goddess Maia. The maypole, which represents renewal and fertility, was decorated with hawthorn. 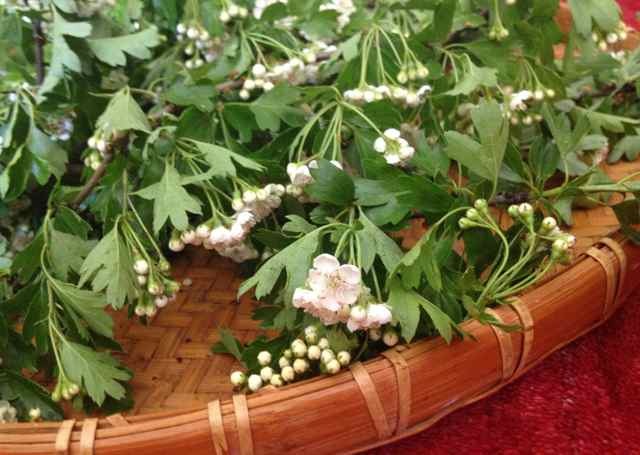 During ancient Greek weddings, guests brought sprigs of hawthorn to bring happiness and prosperity to the new couple. Hawthorn has been used by European people for spiritual protection in a similar way to Native American people’s use of wild rose. It was attached to babies’ cradleboards, windows and doorways to offer defense against illness and unwanted influences. “Haw” is German for hedge. Hawthorn was valued as a hedge or fence to mark land plots by many American immigrant farmers. This living hedge provided a windbreak and offers a place for pollinators, birds and other animals to thrive. 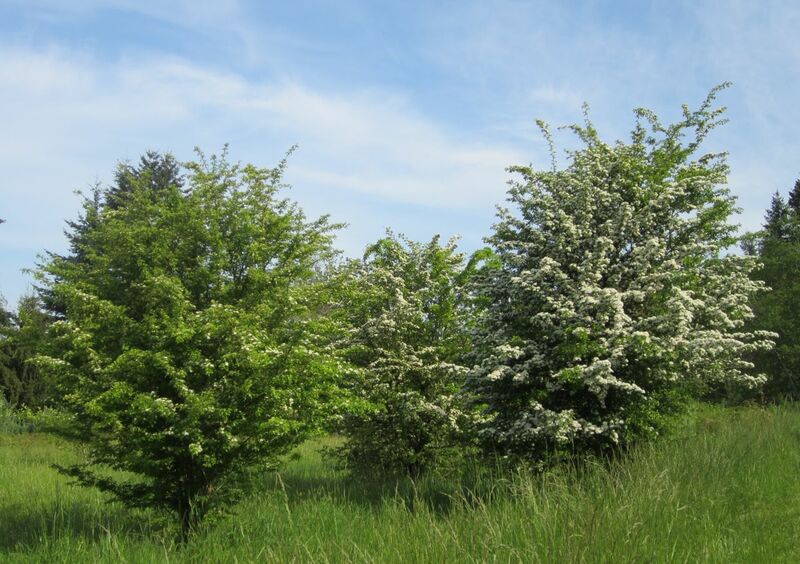 You can still see hawthorn hedgerows on old farms and public spaces throughout the Northwest. I like the idea of bringing biodiversity back to farming and see local farmers re-embracing these old values through planting hedgerows. Foster and Hobbs. Western Medicinal Plants and Herbs. Peterson Field Guide. 2002. McIntyre, Anne. The Complete Floral Healer. Sterling, 2002. Moerman, Daniel. Native American Ethnobotany. Timber Press, 1998. Peersen, Mark. Nutritional Herbology. Whitman Publications, 2008. Talbot and Whiteman, Brother Cadfael’s Garden. Little, Brown and Co. 1996. Weiss, Rudolf. Herbal Medicine. Beaconsfield, England, 1998. Thank you for the useful information in this article about Hawthorn, plus the listing of resources. I ordered Weiss’book Herbal Medicine based on your knowledgeable and clear writing. I have not seen it for sale except from Pixie Honey. It is easy to infuse yourself in the spring. Good luck! now is a good time to make your honey as the haws are ready to pick now. just get some fresh spun honey from a local farmer…pick your haws. Slowly over low heat, heat your honey in a double boiler. Clean the stones out of the haw, then add them to your honey. Slowly heat through…so not boil. Then place in a jar and lid it. Let it sit for a time and there you have it…You can again slowly heat it after it is to your tasting and then strain the haws out. I just eat them. So if I missed what color the flowers were in the Spring, is there any way to know now if its a hybrid or the pink variety now that it’s September? 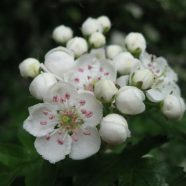 Hawthorn flowers are white in spring. I do not know how to tell if the flowers are pink when fall comes, but I just try to pay attention in the spring. The pink ones do not seem to reproduce in wild spaces and they are not usually found on farms or in hedge rows. Thanks EagleSong – that sounds beautiful! Thank you for a beautiful presentation of the Hawthorn. As a chemist, selling natural remedies in Holland, Crataegus was a much praised and asked for remedy, in capsules, sold often to men with high blood pressure. It’s very useful to read the domestic practice of hawthorn use and I’m going follow that recipe to make hawthorn honey. I now live in rural UK with lots of hawthorns around me. Much appreciated! This post was so great! Just wondering, in the cordial recipe, is that 2 oz dried hawthorne by weight? Or is it measured in fluid ounces like the other ingredients? That is dried hawthorn berries and fluid ounces. Do you weigh out the dried berries or use 1/4 cup of dried berries? Do you mean for the hawthorn cordial? ‘A-Fib’ is short for Atrial Fibrillation, sometimes called heart flutter,or palpitation & very much stress related which I suffered, having a highly stressful job. Hawthorne relieved this problem imediately. Lightly simmered for a few minutes in water,although I love the tincture in brandy. I am interested in knowing if the seeds have any value. Also,I have sped up the tincture process by decocting in half the water,cooling, then adding sufficient alcohol to preserve & further extract & storing. I use the next day with good results. I recently discovered I have many Hawthorne trees on my property here in Idaho. However, the berries are now dry on the trees. Do you know if there is still any value to them or do I need to wait for new berries next year? Thanks! If they are still reddish they probably still have medicine. It must have been a dry year there! Do you dry the berries in the same way as the flowers, or is there another method for doing this? Yes, you can pick the berries off the stems and dry them in baskets in a well ventilated place or in a dehydrator at a low temperature. I am surrounded by these beautifull trees This year is an amazing year for apples,black raspberries, rose hips, and haws.I am having fun making all kinds of jams, jellies ,and teas.Ontario,Canada. Does hawthorn grow in the Northwest? I live in Montana. I am assuming that the European hawthorn grows in Montana but I am not sure. Look for medium sized trees with bright red berries, thorns and the characteristic leaves. I purchased cut hawthorn berries (1 oz) at the health food store. It looks like crushed dried berries. How do I make that into a tea? I only see recipes/instructions using whole fresh or dried berries. Also, can I have the recipe for the nettle, hawthorn tea? I love nettle tea and would like that recipe. Hi Tena. Crushed hawthorn is fine and I would use about 1 teaspoon per cup. Steep them 15 minutes or longer. You can even steep them overnight. I just blend equal parts nettle and hawthorn to make tea and use about 1 T. per cup of boiled water. Steep it 15 minutes to several hours. Enjoy! Sounds like you have some great experience with hawthorn. I would dry the berries, chop them in a food processor or blender to break up the tough outer berry and then extract them in vinegar. Also, you might check out the hawthorn solid extract from Wise Woman Herbals. I think they probably make a tincture and then turn it into a very concentrated syrup by heating it on very low for a long period of time and then adding honey. It is delicious. Good luck and maybe licorice would be a good herb for you with low blood pressure and respiratory issues? I am currently new to using hawthorn and am wondering about the seeds. I have read that the seeds are poisonous. Therefore, if you were to dry them and then chop them up with a food processor then you are also ingesting the seeds. Isn’t this harmful? And in another article from a different site it said hawthorn was in the apple family, hence the seeds containing cyanide? I am quite confused as you can probably gather. It is quite confusing. Cyanic compounds in plant seeds evaporate when they are heated and when they are dried. I do not recommend eating hawthorn seeds, but I do dry them for tea, tincture them, and cook them to make jelly and cordial When you process them this way the cyanic compounds are denatured, and of course, the seeds are filtered out.